Will AOL Join Huffington's Call to Prosecute Bush Crimes? Dare we think think it? AOL could be putting editorial control of everything it publishes in the hands of someone who thinks Bush should be prosecuted for Constitutional violations? How does that play in the AOL boardroom? Does Arianna stomp in and say "don't f___ with me boys", or is this the beginning of a journalist versus bean counter battle royale designed to squelch progressive passion? Many fear AOL is buying Arianna's business to muzzle her, pretending to move leftward with a hidden agenda of pacification. Will they dampen liberal voices after their low-info audiences are co-mingled with HuffPo's readership? HuffPo is a juggernaut of wide reporting and real-time debunking with the ears of smart readers in government , media, tech and showbiz, impacting the national dialogue with stories that can burn up right wing astroturf money in seconds. HuffPo's octopus-like coverage of so much daily dirt in so many categories with marquee names brought a new brand of interactive traffic, the template for sites like the Daily Beast and the anti-informational BigGovernment. The site looks like an online news journal but with wild and wooly debates below the comments line that could last weeks and total in the tens of thousands. Reports say Arianna is retaining 'chief editorial control', but will the old boys of media let in someone out of step with the coordinated news blackouts? Will we see the ugly, inconvenient stories about our government's most hushed scandals? The Obama administration, for example, is considered derelict in overlooking (and continuing) war crimes by HuffPo, even after Obama himself posted opeds to the site. Would AOL's profit-hungry corporate board mind if their publishing arm said President Bush or Obama should be investigated or tried in the Hague? Team Arianna could be much more transformative were they open about the terms of the deal. Independent online journalism is a hard-hitting, determinative tool for 21st Century democracy is the merger of transparency and technology we see plunging a stake into the heart of international kleptocracies in recent days. Openness, rapid-responses, crowdsourcing, data dumps, fact checking and interconnectivity with Facebook and Twitter were all directional decisions made by "new media" prime movers, embracing rather than competing with other platforms and infostreams. So is this merger a takeover of mainstream media -- or a surrender? We now ask: were non-disclosures signed? What about non-competes, guarantees, escape valves and everything else, down to the red jellybeans. Why is it any of our business? We are the readers, the commenters, the critics, the feeder sites that link and reference HuffPo each and every day. We are all individual voices that document the aggregate American will, organized and channelled intelligently by technology. 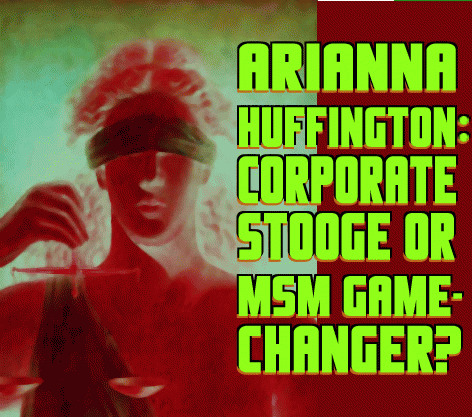 But is Arianna actually going to be ending the major media "reality lock-out"? HuffPo has reported on controversial stories routinely whitewashed on network and cable TV. For example, the Mike Connell and Karl Rove subpoenas suggesting an Ohio 2004 election theft got "back-page" treatment at HP, but they were completely missing from national TV news. HuffPo's minimal mention of reports Cheney was on the DC Madam's call list were editorial judgment calls that could have, if expanded, changed the course of history. Huffington at the time gave it a smidge of space, but backed off when the story didn't resonate in the MSM. On the other hand, they were all over Cheney's Nigerian arrest warrant dust-up, covering the "legalization" of blatant bribery by an ex-US President when few others would. HuffPo also published also recent leaks showing Obama and GOP Senators interfered in Spain's pursuit of the "Bush Six" on torture charges. HuffPo staff has long culled the riskier journalistic stretches of the day - the truth movement, the JFK conspiracists, UFO abductees, the murkiest media wars and so on, but they have also kept up diligent hand-moderation of comments, unlike sites which rely on reader flags. This business model has shown policy consistency and set industry standards for 'clean' (or 'cleansed'?) online journalism, though many would-be contributors curse HuffPo after their own rejections, the web remains open elsewhere for crybabies. AOL's tidal wave of traffic could unintentionally or intentionally dilute the site's quality as HuffPo's common denominator sinks - will her surge in volume see pageviews, profits and PR trump the four W's of real journalism? Just today, Gawker is claiming the newly opened spot as the #1 "independent" news blog online. But what of our own site and similar blogs or aggregators? Our proprietor has had a Huffington byline since 2008, but sites like OpEd News or Salon, Slate, TPM, Raw Story, DailyKos, Democratic Underground all have their spots and specialties along the indie media continuum that will stick around whichever way the SS Huffington might sail. With other recent shake-ups at MSNBC and CBS News, it seems the media chess pieces are lining up for something new and different staring us down the barrel of the game-changing Citizens United ruling. It's possible AOL took a look at MSNBC's outlying position as the left-most cable network and leapfrogged them by a factor of ten, looking to be perhaps the counterbalance to Fox News who is slated to receive untold millions in third-party attack advertising. With the Olbermann-Maddow-Schultz-O'Donnell line up proving lefty broadcasting can be financially lucrative, mayhaps AOL is strategically placing themselves as the largest potential recipient for countervailing attack ads purchased by Democratic big spenders? If so, it might be a wise move for their bottom line, cementing the win-win Arianna cites, where AOL capitalizes financially as HuffPo captures eyeballs, concerned it seems with keeping up with the right in "messaging" as 2012 approaches. I believe the unlimited corporate spending may lay waste to our electoral landscape, but I never considered that there might be a left-wing invasion of the mainstream media. My concern of course is truth in journalism, social justice and lifting the veil of government secrecy, but it is plausible the two could co-exist. While some predict Arianna is yet again changing her spots, I think she understands our economic crisis requires less partisanship and more fact-based publishing and that the improvements to AOL trump the compromises of HuffPo. The day-to-day details of these battles will be Arianna's new hell, but our thousands of comments also inform debates on the issues as well. For now I will observe and report, but I would love to hear what you think below.